The game’s afoot. For all Sherlock Holmes fans, from March 16-18 in Cape May, New Jersey, the Sherlock Holmes Weekend takes place. Everyone attending the event at the Inn of Cape May, preferably in Victorian attire, will be attempting to solve a mystery. Well, I wish I could be there—for no other reason than to don one of those great Victorian hats. For those who can’t and are hunting for a good mystery for young people, I’m going to recommend two titles over the next two days. Read them along with a couple of Sherlock Holmes stories, and you will experience a sleuthing weekend for the whole family. Mystery writers for adults—those like Rick Riordan or Carl Hiaasen—often make the best writers for children, when they decide to create books for this audience. They have already learned to craft enticing plots and develop intriguing characters; all they need to do is find the appropriate subject matter for children. 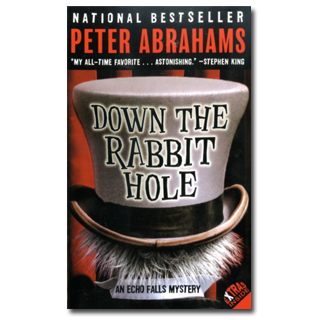 In 2005 mystery writer Peter Abrahams published Down the Rabbit Hole, the first book in the Echo Falls Mystery series. In this debut children’s novel he demonstrates finesse that would take most other writers for children years to develop. In this mystery ideal for ten- through fourteen-year-olds, thirteen-year-old Ingrid takes a wrong turn as she runs through the town of Echo Falls and finds herself in the seedy part of town. There she meets a woman called Cracked-up Kate, right before Kate gets murdered. Because Ingrid has left her soccer cleats at the scene of the crime, she returns to get them at Kate’s house. But someone else now roams the neighborhood, probably the murderer. Although Ingrid is good friends with the son of the police chief, she decides to solve the crime herself, drawing on her extensive reading of Sherlock Holmes. That’s not all that she accomplishes: she helps her grandfather save land from developers and gets the lead role in the local Alice in Wonderland play. She even finds romance! This mystery works very well for those who want intrigue and excitement but don’t want to be scared too much. Everything Ingrid does is totally believable and within the range of any normal thirteen-year-old. She has no super powers but still solves the crime and narrowly escapes becoming the next murder victim herself. For those who like this modern-day Nancy Drew, there are two more books in the series: Behind the Curtain and Into the Dark. Now all I have to do is find that Victorian hat before I tell you about our next mystery. Another footstep, soft but closer. Then a few more, followed by silence. Ingrid pictured someone standing by the police tape. She even thought she sensed the force of a straining human mind. A narrow beam of light flashed on, arced across the floor, then up and out of her sight. She heard a soft grunt: a man ducking under the tape. Ingrid knew it was a man from the sound of his grunt. The footsteps drew closer. The feet themselves came into view, lit by the soft edges of the narrow beam: dirty, man-size tennis sneakers with those three Adidas stripes, spattered with dark-green paint. Originally posted March 18, 2011. Updated for . I love the Echo Falls mysteries and have read them all. Peter Abrahams can be very very funny, though his thrillers for adults are too dark for me. As Spencer Quinn, he has also written three (another coming in the fall) detective stories for grownups which are narrated by the dog, Chet, and are laugh-out-loud hilarious even though there are elements of gore and suspense. Good luck finding that hat! I really enjoyed the first two in this series and hunted down one of his adult books too. I like that Ingrid is a fairly normal girl, not boy crazy, not too precocious.